Today, there is more available information about traumatic brain injuries than ever before. There are now studies relating to how contact sports (such as football) lead to traumatic brain injuries. The world is starting to recognize the issue on a broader scale. Still, treatment is a mystery to some. A significant blow to the head or a twist of the neck is terrifying. Typically, the injury is not severe. There are cases, however, where a simple concussion is only the beginning. Some patients suffer from internal bleeding of the brain or a crack in the skull. In such cases, a CT scan is used to determine the extent of the damage. Often, a CT (computerized tomography) scan is necessary. A scan is designed to show the doctor if there is swelling or bleeding in the brain, or potentially a fracture to the skull. If there are signs of severe head trauma, a CT scan is the first test ordered to diagnose the condition. Your doctor will closely examine the scanned image for signs of a developing disorder or trauma. According to reports, if you do not display any of the above-mentioned symptoms after an injury to the head, your risk of complications is around 1 in 7000. A CT scan is unlikely to help in such a case. 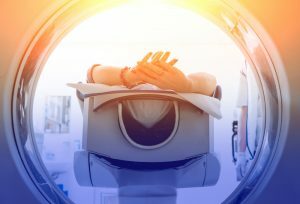 While a CT scan is typically used to diagnose a traumatic brain injury, there are other methods often used. There is no single test that can definitively confirm a TBI. 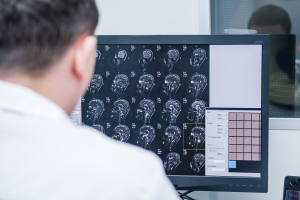 However, your doctor can assess the history of the injury, symptoms displayed, perform a physical examination, and schedule additional tests (including neuroradiology) to confirm the diagnosis. 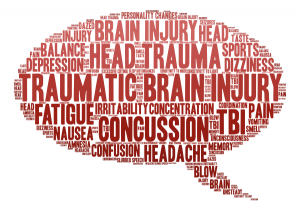 Typically, TBI patients experience a loss of consciousness when enduring such a traumatic injury. This loss of consciousness ranges from a few seconds to a few minutes. In the most severe traumatic brain injury cases, the loss of consciousness can result in days spent in a coma. Even worse, some never leave a coma after their injury. Furthermore, most TBI patients experience some form of amnesia, whether minor or long-lasting. So, when is the CT scan used in the diagnosis phase? A CT scan is used in conjunction with other diagnostic methods. 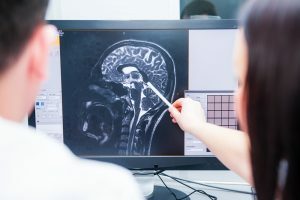 Typically, a CT scan, which is fast and accurate, is used to diagnose acute head trauma that requires emergency treatment, such as surgery, to prevent life-threatening conditions. It starts with a visual diagnosis more than anything else, though. If you or a loved one suffers from a traumatic brain injury and is living with the symptoms, consider TryMunity your number one source of support and informative articles on TBIs. The majority of traumatic brain injuries are relatively mild. However, even the least serious brain injuries can have long-lasting health implications. One of the primary concerns with such an injury is that the situation can quickly worsen without proper treatment. Following an accident of any kind involving the head, you should seek medical attention. During the visit, the doctor will examine the head and most likely schedule a neurological exam, including an X-ray of the brain. It is here that any noticeable damage will be discovered and diagnosed for further treatment. If you or someone you know has sustained a serious head-related injury, you’ll want to rush to the nearest hospital. Here, medical professionals will begin their diagnosis. This information can be answered by relatively basic questions, and they provide a good indication of the extent of the injury for the doctor. Doctors are somewhat forced to rely on firsthand accounts of the injury for necessary information. With this information out of the way, your doctor will select a method of diagnosis. This often includes an imaging test, such as a CT Scan or MRI. Both are common methods for diagnosing head trauma. Computerized Tomography Scan (CT) – A CT scan is often performed in the emergency room on any patient suspected of having a traumatic brain injury. The scan uses X-rays to create a detailed image of the brain. Then, doctors can quickly visualize any fractures, locate internal bleeding, blood clots, bruised tissue, or swelling, and begin treatment. Magnetic Resonance Imaging (MRI) – An MRI utilizes radio waves and magnets to create an image of the brain. The test is often administered after the conditions stabilize or if symptoms do not improve shortly. Following a diagnosis, TBI treatment may begin. The treatment method varies depending on the severity of the injury. For a mild traumatic brain injury, no other treatment besides rest and over-the-counter pain medication is required. Your doctor may pull you out of school or work for the time being. For severe, emergency brain injuries, the patient will require enough oxygen to survive and an adequate blood supply for the brain. Treatment will begin in the emergency room or intensive care unit under the care of a highly-trained neurologist. 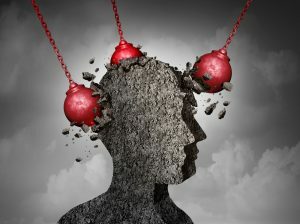 Dealing with life after a traumatic brain injury can be overwhelming to many. If you or a loved one has suffered from TBI, visit the TryMunity website for support and informative articles. There have been rare cases in which an individual who suffered a traumatic brain injury passed away, many years later, with no obvious signs or cause of death. There are generally no signs of foul play in such cases, either. Experts are still unclear on what would lead to such an unexpected passing, however. All signs of the traumatic brain injury were addressed. Why would someone simply die from their injury many years later? So, can someone die from a traumatic brain injury? Absolutely, but the circumstances surrounding such a death are often mysterious and basked in questions. According to recent studies, an individual who has suffered from a traumatic brain injury may experience a higher risk of early death. The risks that typically follow include another brain injury, assault, and suicide. Furthermore, the risks of psychiatric or drug abuse issues are also dramatically increased following a brain injury. According to lead researcher Dr. Seena Fazel, a Wellcome Trust research fellow at the University of Oxford in England, “patients have a threefold increased risk of dying prematurely.” Three times more likely! That is a profound increase. 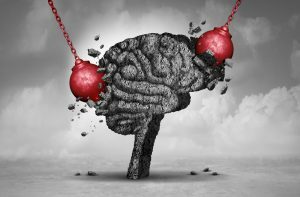 Furthermore, the same study revealed that 61 percent of traumatic brain injury patients suffered from psychiatric or substance abuse issues. In some cases, these issues were often present before the injury, while others developed them after their injury. • In 2013, nearly 2.8 million traumatic brain injury patients were brought to emergency rooms. • Traumatic brain injuries also accounted for nearly 50,000 deaths. • From 2007 to 2013, the rate at which TBI victims passed away decreased by 5 percent, while emergency room visits increased by nearly 47 percent. Traumatic brain injuries are quite severe. However, in recent years, as we can see by the increase in emergency room visits, recognition and understanding of the issue at hand have become more pronounced across the country. With sports being the number one cause of traumatic brain injuries, greater steps are taken to promote health and well-being both on the field/track and off. Currently, the leading cause of traumatic brain injuries is actually bicycling. Most people would say football, boxing, or wrestling. However, bicycle accidents tend to cause more traumatic brain injuries than any other type of activity or sport. It truly pays to remain safe and take precautions against such injuries while performing any strenuous or potentially dangerous activities. Wearing a helmet, for example, can save your life and reduce the chance of a traumatic brain injury. If you or someone you know has suffered from a traumatic brain injury, support them in any way possible. When you need support of your own, know that TryMunity is the leading community for traumatic brain injury patients and their families. Lean more about TryMunity and join our network today at community.trymunity.com! Despite their prevalence, sports-related injuries rarely lead to fatalities. However, when such injuries do lead to death, the leading cause is a traumatic brain injury. In fact, around 21 percent of all traumatic brain injuries among children and adolescents are due to sports activities. According to the U.S. Consumer Product Safety Commission, an estimated 446,788 sports-related head injuries occurred in the United States in 2009. That is an increase of nearly 100,000 since 2008. Today, the numbers are even higher. The types of sports vary, as do the level of injury. That does not lessen their impact in any way, though. 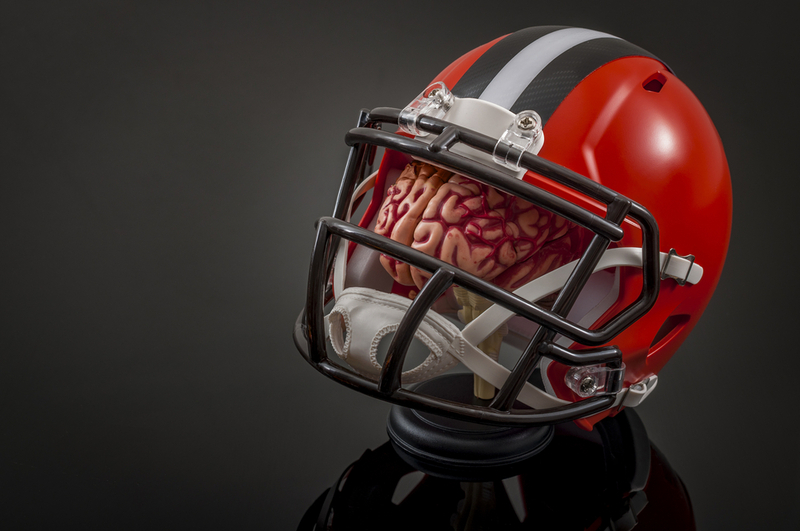 It is incredibly surprising to learn that, despite what most people think, football is not the number one sports-related cause of traumatic brain injuries. The contact sport still leads to plenty of head injuries across the nation, however, cycling takes the number one spot. Far too many individuals do not wear their helmet while cycling, or they wear an improperly-sized helmet that could fall off during an accident. Either way, the situation leads to traumatic brain injuries quite often. Following any sort of head injury during sports or recreational activities, a thorough medical evaluation is required. During the evaluation, most injured patients will undergo a neurocognitive test before anything else. A baseline must be established for normal brain function, including tests of memory, attention, problem-solving, and other mental capabilities. Grade 1 – Mild physical trauma, such as a contusion or bump. Grade 2 – Headaches, often migraine-like, with accompanying symptoms. Grade 3 – Mild traumatic brain injury, often with a sudden change to mental capacity or consciousness. Grade 4 – TBI with loss of consciousness for over 1 minute, amnesia for longer than 30 minutes, but less than 24 hours. Grade 5 – Severe TBI, often life-threatening, with physical injuries, internal bleeding, increased intracranial pressure, loss of consciousness, amnesia lasting longer than 24 hours. 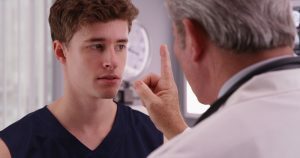 A traumatic brain injury, no matter the grade or severity, can be quite dangerous if not examined by a medical professional immediately. Please do not hesitate to seek out medical assistance. Either go to an emergency room or your family doctor, depending on the severity of the injury, quickly. TryMunity is a nonprofit organization focused on increasing awareness and offering support to traumatic brain injury survivors and their families. See support of your own by joining our network at community.trymunity.com.